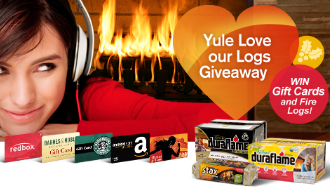 Duraflame Yule Love Our Logs Giveaway – Win a $25 gift card & more! Win a $25 gift card and a case of Duraflame logs for yourself and a friend! ENTER SWEEPSTAKES HERE – Duraflame Sweepstakes page. ELIGIBILITY – Giveaway is open to legal residents of the 50 United States who are at least 18 years of age. SWEEPSTAKES PERIOD – Giveaway starts at 6 AM Pacific Standard Time (“PST”) on December 1, 2014 and ends at 11:59 PM (“PST”) on December 31, 2014. PRIZES – One (1) winner will be chosen each week in December to receive one (1) $25 gift card, one (1) case of duraflame® fire logs for themselves and, one (1) $25 gift card, one (1) case of duraflame® fire logs for a friend.